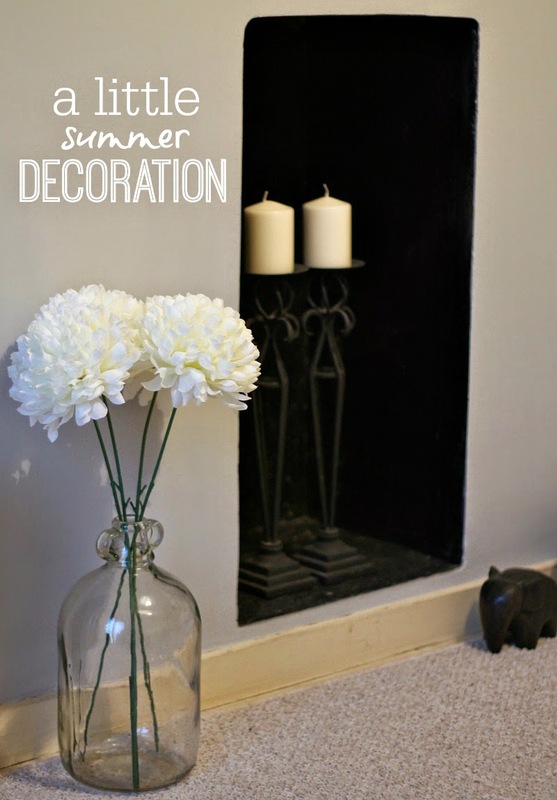 One of my projects this summer was to redecorate our sitting room. 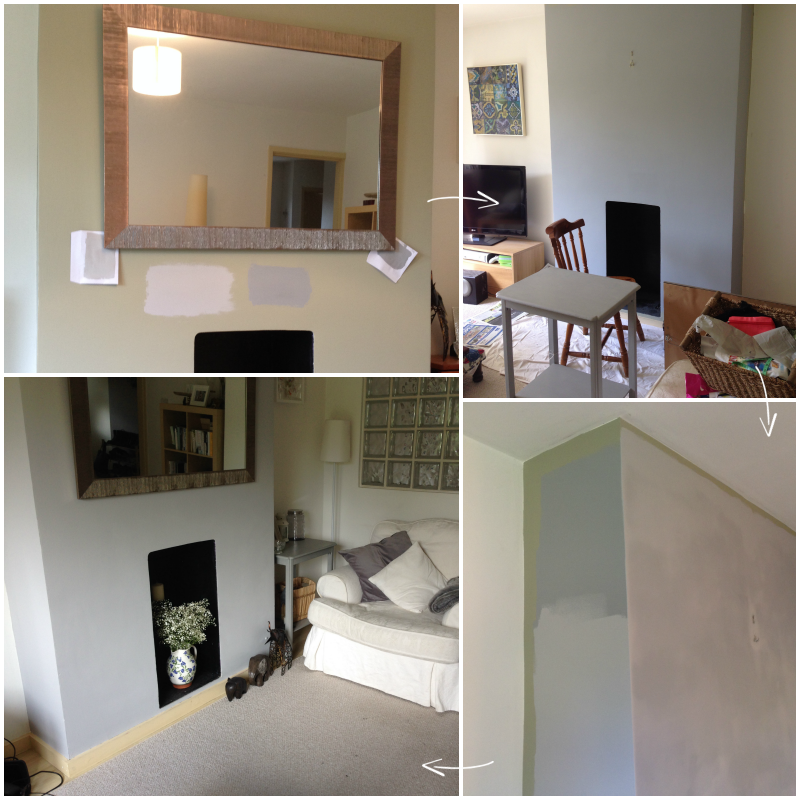 Living in rented accommodation we're not able to change things drastically, but painting the chimney breast is something we are able to do. After pinning a load of images for inspiration I settled on a grey theme, and hopped down to Homebase to buy some paint samples. After choosing what I thought was the ideal shade (Warm Pewter by Dulux) I set about painting, soon to realise it was a little too blue for my liking. You can see it in the collage below - the top right image. Back to Homebase I went, and settled on a lighter shade - Chic Shadow, again by Dulux. Luckily this time round it was perfect, and I am so happy with the result! You may notice our pretty hideous skirting boards. The job is not finished, but we are just waiting to get the OK from our landlord to re-paint them a nice glossy white. You may think we're mad for spending time decorating a home that isn't technically ours, but I'm of the view that we've gotta live here for at least another year (we've been in a year already) so we might as well make it pretty. Agreed? I'll link some of the bits we've bought for our sitting room below - lots of new bits but also some things we've had for a while. We picked up the white armchair from a local charity shop for £60 which we're super pleased with - don't be afraid to buy second hand! Just give it a good look over before you buy... and the all important sniff test. I also found this side table at a reclaimed furniture store for twenty-something quid, in the perfect grey shade. It's as if they knew I was coming! I LOVE the colour you chose, so chic and understated! You're so lovely and coordinated! We have just moved into a new build flat so we can't paint for 6 months, boo! OXYPRO Cleaning System is one of the leading brands providing quality, and environmental;friendly Specialty cleaning solutions for laundry, kitchen, housekeeping, food manufacturing, and industrial industries.